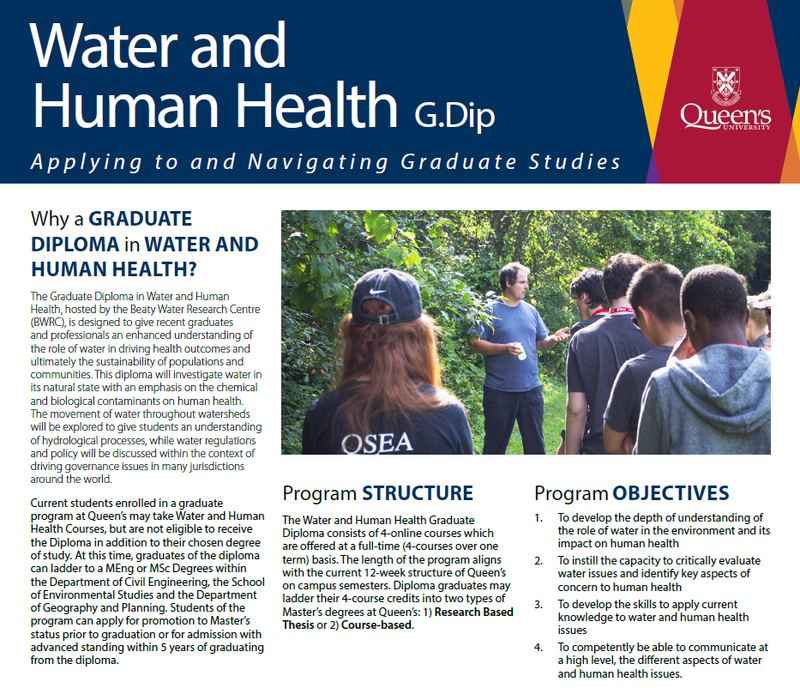 Why a Graduate Diploma in Water and Human Health? Register Here for May 2019 Start! See the Full Brochure Here! The Graduate Diploma in Water and Human Health, hosted by the Beaty Water Research Centre (BWRC), is designed to give recent graduates and professionals an enhanced understanding of the role of water in driving health outcomes and ultimately the sustainability of populations and communities. This diploma will investigate water in its natural state with an emphasis on the chemical and biological contaminants on human health. The movement of water throughout watersheds will be explored to give students an understanding of hydrological processes, while water regulations and policy will be discussed within the context of driving governance issues in many jurisdictions around the world. 4. To competently be able to communicate at a high level, the different aspects of water and human health issues. This diploma is designed to prepare students for a career in a variety of industries and organizations. This includes working in the public health sector, engineering and environmental consulting, conservation authorities, non-profit organizations and government planning and management.